In my dream, I made Stephen a meatloaf. That was the thought that echoed inside my head inside the dream that I was having, and if I was struck – inside the dream, inside my head – by the banality of the situation, I didn’t mind it. I was going to make Stephen a meatloaf! I was in a kitchen. It was my kitchen, but it wasn’t my kitchen – far too many familiar Things slightly askew and all manner of angles and proportions totally off or absent. Yet, it was a near perfect square of a space – four walls, but only three that I could see. I never turned around, but I remember feeling the fourth wall at my back even as I looked in from above, in the dream, to see myself facing walls 1, 2 and 3. Everything was yellow and blue, I think. The floor was blue, I’m sure of it. 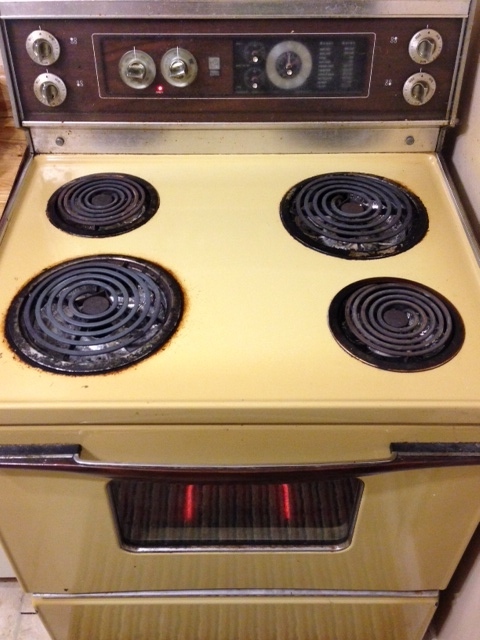 The oven was yellow, dated: a 1970s-ish nightmare with an opaque, greased-over-from-a-million-uses cube of a window protruding from its exact centre. I watched myself toss, throw, hurl and dump all manner of ingredients into the silver mixing bowl that I bought in Chinatown and that I keep in a cupboard by the sink. Into the bowl went globs of indiscernible brown-bridge goo, torrents of indistinct liquid, clouds of indistinguishable powder. Meatloaf into meatloaf tray –> meatloaf tray into oven –> oven turned on high-highest. The meatloaf started to raise, immediately (I did not know they rose. That was a dream surprise for me). It soon over took the tray and threatened to very quickly overwhelm the inside of the greasy-1970s-yellow-cube-oven. I waited and I waited and I waited for it to get big, big, B-I-G enough! A stephen meatloaf had to be big, big, big B-I-G, or it couldn’t be Stephen Meatloaf! When it was done, it too was an almost perfect cube. I pried it out of the oven with two thick black plastic spatulas. I plopped the Thing on the table by the sliding door that, I knew, wasn’t just there before. And then, looking down at the meatloaf, I was wreaked with a kind horrific epiphany. Even though I knew exactly what I was doing, it came out completely wrong. The meatloaf was too messy; stuff was mixed and blended everywhere. There was no separating them; no hope of returning to basic elements. No going back to the time before the meatloaf. Before I made Stephen a meatloaf. The puzzle had been pulped. I remember gasping myself awake. Then being awake and staring at an empty ceiling in the near dark of the early morning, listening to the blood rush in my ears. Stephen was sleeping soundly beside me, totally unaffected. I reached over and poked and squeezed him. He was all there, intact and snoring lightly. He was turned towards the wall with his back to me. Rather loaf-like, if I had to admit it. Eventually, I tried to fall back asleep again, with the hope that I would not finish the possibly unfinished dream. Still, I wonder…if I had gone just a bit further, in the dream, what could have been. Possibly, it would have been delicious? “Interesting” is not the word.